As I strive to make modbox USA a reality, I’ve become mid-century modern social media connected. Yes, I’ve turned to my high-school aged sons for guidance. They’ve had countless chuckles about my online social ignorance. I’m finding a lot of interesting blogs though, that center around the mid-century. Yesterday, I stumbled across Kimberly’s Mid-Century Living blog. I thought it was really neat how she used a “Mod little me (1972)” photo in her about section. I’m going to have to dig out one of my old photos! Great idea Kimberly. On her blog, she also placed some images from old Sears catalogs. 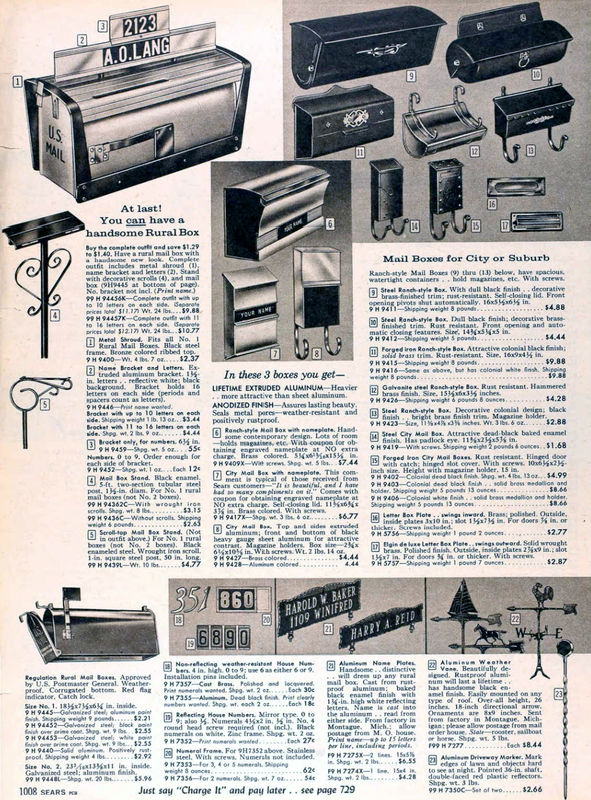 Recall in my prior post, I have images of the mid-century modern mailbox that Sears showcased in their 1961 Diamond Jubilee catalog. I was very interested to find out what the mailboxes in the 1960 catalogs looked like. Kimberly was kind-enough to scan and send the pages (click here for full page). Thanks Kimberly! I found it very interesting that in 1960 Sears introduced a ‘metal shroud’ and said: “At last! You can have a handsome Rural Mailbox.” Notice too, the metal shroud is a black steel frame, with bronze colored ribbed top. Based on the 1960 catalog, it appears that 1961 was when Sears first introduced their truly modern design. Growing up, I seem to remember that Sears was not a design innovator, rather they tended to reverse-engineer other folk’s products and put their name on it. Lawn mowers are a good example. That would suggest that a metal fabricator, like Leigh Building Products, probably had a similar design prior to 1960.